All year I think about cyclocross. Midway through the 2016 Australian cyclocross season, I realised there were products available, that would increase my enjoyment of cyclocross. I couldn’t buy them in Australia, companies didn’t offer shipping to Australia. Simply, no one was prepared to pay for it. I reached out to some of these companies and have been entrusted to build a group of users for them on this side of the globe. Cyclocross Minded Australia was born. I’m incredibly proud to be working with Horst Engineering to bring their world class cross spikes to Australia and also We Are Butter to bring their chain keepers and tubular red tape to Australian cyclocross racers. I’m unsure if all of our future partners will be cyclocross specific, but it will remain a strong theme throughout our product portfolios. I am a cyclocross tragic, I love it more than any other form of cycling I’ve tried. I substitute my passion for any claim to ability. 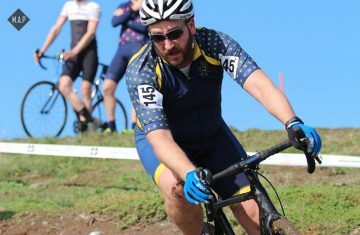 For me, the community behind Australian cyclocross is the absolute highlight. Meanwhile, I get to ride bikes and talk rubbish with mates! I am passionate about the growth of cx in Australia. I am keen to work with all to promote the sport, however I am unapologetic in focusing our efforts on promoting women’s and junior’s riding and racing!